RunSignUp Results now supports automatic generation of Finisher Certificates. We use a default certificate that automatically fills in the runner’s name, Race Name, Finish Time, Place, and the logo for the race that was uploaded. An example is on the right. There is no work for the race director to do other than assure the results were uploaded to connect with the participants. Here is an example of a certificate created from a Microsoft Word Template that was customized with adding signature images from the Mayor and Race Director. 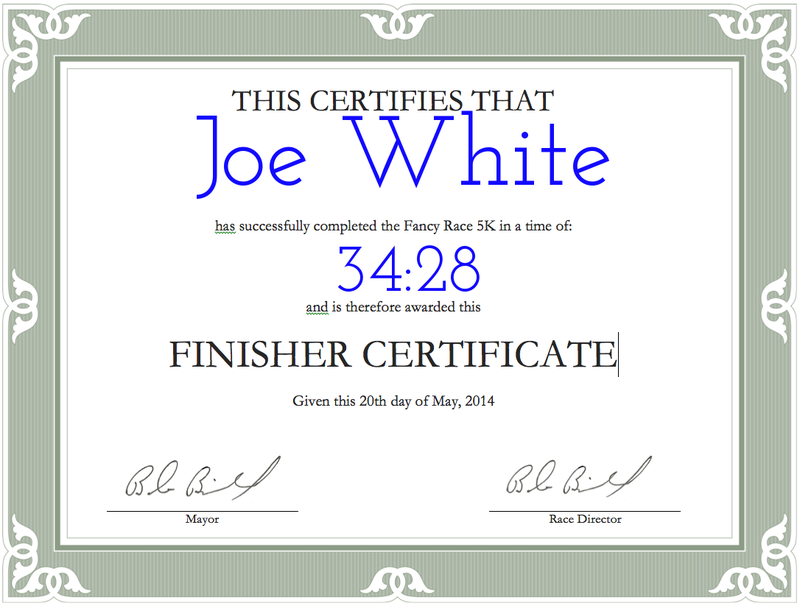 The finisher’s name and time was added, and a custom font and color was selected. You can set up multiple certificate layouts and save them so your race committee can vote on their favorite and all you need to do is select one and it is immediately deployed. You can also select which races have which certificate background. For example, you could have separate certificates on a per year basis. Or you could have a different certificate for the Marathon and your Half Marathon. The certificate is published as an image, and we provide convenient share and print options.